Truro City are set to sell the club's Treyew Road ground to help raise funds for the new £15.2m Stadium for Cornwall according to chairman Kevin Heaney. He told BBC Radio Cornwall that a 'national developer' was in talks about buying the ground. The project at Threemilestone has been delayed by funding problems. And the club had been frozen out of talks about the new stadium after they were made the subject of a over unpaid taxes. The delay in building the new 10,000-seat stadium has dashed any hope of the should they win the Championship, and over funding proposals. but Heaney says selling Treyew Road is the only way to pay their share of the building costs. "It's no different to when Arsenal developed Highbury and the developers part-funded the money from that to build their new stadium at Ashburton Grove," he said. "We already know the figures and my understanding is that the money that indirectly goes to the football club, through enabling development of the land, is the same figure that Truro College and the Cornish Pirates are putting in. "My understanding is that a contract to be signed is imminent, subject to what contract the stadium organisers want Truro City to sign with the developers." 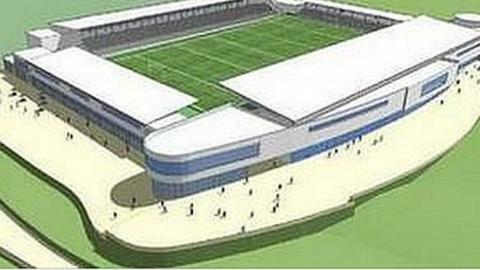 Heaney believes the new stadium is vital for the county. "We are 100% committed, not just for Truro City but for the people of Cornwall and all the users," he added. "This is a community stadium, it's not just going to have football and rugby, it's going to have many other uses, it's bringing Cornwall into the 21st century."